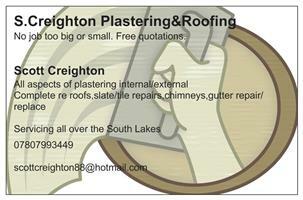 Hi I'm Scott Creighton owner of S.Creighton Plastering & Roofing. I provide a friendly, reliable and affordable service carried out to the highest standards. I offer free no obligation quotations. I have over 10 years experience in plastering and roofing. Some of the services I provide are as follows (please note this list is not exhaustive): PLASTERING ROOFING - Skimming - Slate repairs - Wet dash/dry dash - Re-roof (slate and tile) - Rendering - Chimneys - Kingfisher Approved Damp Proofing Contractor- Storm damage - Pointing - Guttering - Flat ceilings - Lead valleys. Please feel free to contact me with any questions or queries.